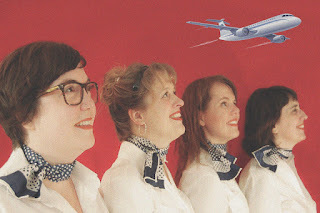 Cherry and Spoon: Fringe Festival 2016: "Snow Country"
Summary: A flight from Minneapolis to Lansing on the (fictional but I wish it existed) Snow Country Airlines - "you can travel without leaving home." Highlights: Madeline (Casey Haeg) needs a new start after her fiance leaves her, so she takes a job as a "comfort consultant" on Snow Country Airlines. We witness her first flight as she meets her new coworkers - flight attendants flirty Trudy (Shanan Custer), stern Gretchen (Heather Meyer), and mentor Carol (Maureen Tubbs), and the bromance pilots (Tom Winner and Eric Webster). Madeline learns to "be the underwire" and stand firm with problem passengers. That's about all that happens, but the entire cast is fantastically funny, there are plenty of local references, and airline travel is so accurately represented it almost made me nauseous. This is a cute, fun, and entertaining show written by and starring a bunch of funny women (and a few men).